We are always delighted to see our customers visit our Nursery at Hitchin. 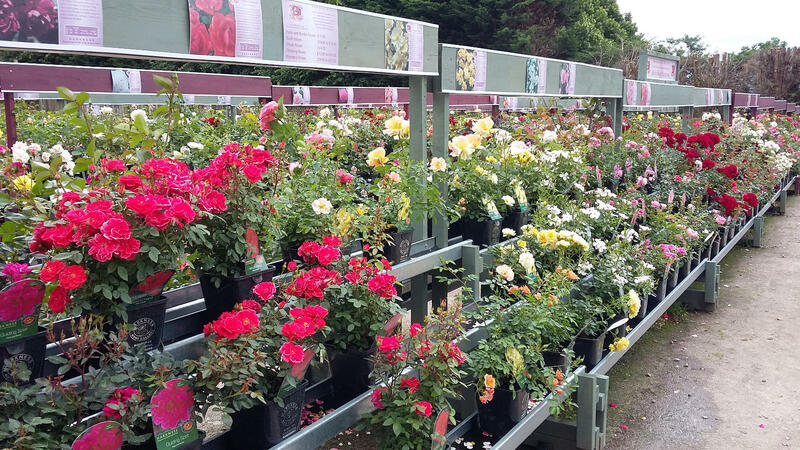 Our retail area is compact, but packed with the best quality rose plants, displayed in a way that allows you to see each individual plant, so you can be sure that the rose you select is of the best quality..
We have our staff on hand to advise you. They are experienced and have a wealth of knowledge to share with you, about which varieties are best for different garden positions, help with planting ideas and colour combinations. We built and designed our own display benches for our Rose Shop as we feel the standard benches sold to Garden Centres do not offer the best environment for the plants, or the best shopping experience for the customers. In total there are about 180 metres of benches to enjoy looking at. That would take Usain Bolt about 19 seconds, it takes most of us a good deal longer! We also have a substantial display of Standard Roses to add to the Bush (Hybrid Tea and Floribunda), Shrub, Climbing and Patio roses. The plants in our shop are available all year, and will be in flower from mid June (depending on the season) each year.